After 31 years at the helm of the greatest art museum in the United States, if not the world, Philippe De Montebello will step aside on January 1, 2009 when Thomas P. Campbell becomes the 9th director in the 138 year history of the Metropolitan Museum of Art in New York City. The exhaustive search took eight months and went around the world before coming home and selecting Campbell, a 46 year old British born tapestries curator who started his career at the Met in 1995. 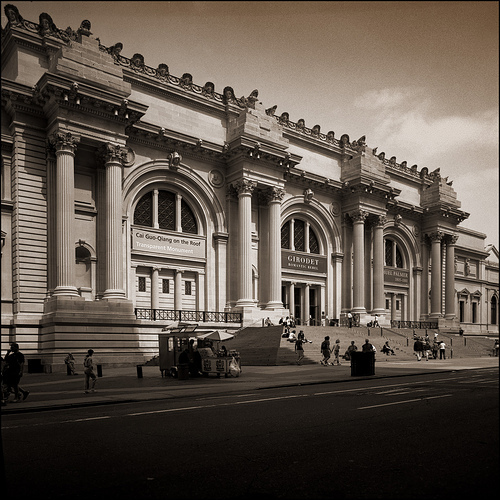 While it seems like so many cultural institution executive searches end up going outside the organization to find their next leader, the Met’s choice is interesting and definitely one to watch. Campbell has very strong subject matter credentials and a solid reputation within the art world; but to date his administrative, managerial and leadership skills are relatively untested. The Metropolitan Museum of Art is a complex institution with the annual budget equivalent to a small country’s GDP and with a downward spiraling economy the job just got a lot tougher. When I arrived in NYC fresh out of college in 1981, the Met became one of my regular stomping grounds and to this day it remains one of my favorite art museums. Congratulations and great to sucess to Mr. Campbell! Here’s a short audio WNYC audio interview with art critic Lee Rosenblum, aka Culture Grrl about the hiring of Thomas Campbell as the next Met director.